Vancouver, BC - Skyharbour Resources Ltd. (TSX-V: SYH) (OTC Grey: SYHBF) (“Skyharbour”) is pleased to announce results from its initial radon in water survey on the Western Athabasca Syndicates’ 246,643 hectare (609,469 acre) Preston Lake Property located south of Fission Uranium (TSX.V: FCU) and Alpha Minerals’ (TSX.V: AMW) Patterson Lake South (“PLS”) high-grade uranium discovery. The Western Athabasca Syndicate (“the Syndicate”) consists of Skyharbour Resources, Athabasca Nuclear Corp. (TSX-V: ASC), Noka Resources Inc. (TSX-V: NX) and Lucky Strike Resources Ltd. (TSX-V: LKY). Recently completed fieldwork included the collection of 291 water samples from lakes, local swamps, and ponds using a float equipped helicopter and boats. Sample targets included both regional reconnaissance areas and the fourteen high-priority targets identified by the Syndicate’s Technical Committee. The samples were analyzed for radon in the field by Terralogic Exploration geologists using a Pylon AB5 Series Portable Radiation Monitor which provides real time analysis of radon levels in both water and soil. 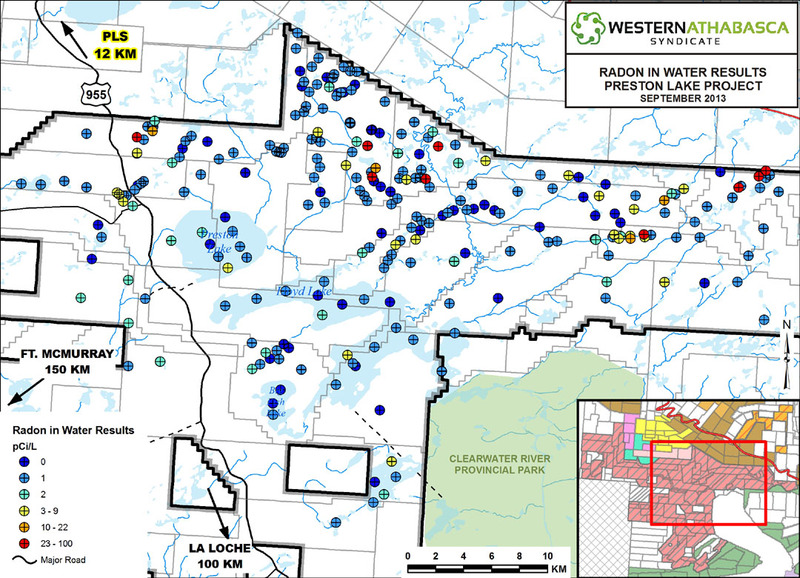 Radon in water survey results were instrumental in identifying first pass drill targets at the nearby PLS discovery and helped vector in on most of the high-grade discovery zones (see Fission’s May 6, 2013 News Release – New Radon Survey Identifies Strongest Anomaly to Date). Final datasets from the helicopter-borne VTEM plus survey (time domain EM and aeromagnetic gradiometer) and the fixed-wing radiometric survey have been received and are currently being analyzed by Phil Robertshaw, P.Geo., for a final detailed interpretation. Other fieldwork to date includes geological mapping and prospecting, soil and silt sampling, and biogeochemical sampling. Final results from the Phase 2 exploration program are still pending and will be reported when received. Targets continue to be prioritized based on a detailed criteria set consisting of similar geological features and exploratory indicators present at Fission and Alpha’s nearby PLS discovery. The Phase 3 exploration program, currently underway at the Preston Lake Property, will include ground work focused on high-priority areas identified from the findings to date, including the radon in water anomalies. By the end of this summer/fall field program in October, a total of approximately $1.5 million will have been spent in exploration on the property via airborne geophysical surveys and follow-up ground work. The goal of this summer’s exploration program is to identify uranium showings and potential drill targets through detailed airborne geophysical surveys, silt and soil sampling, radon sampling, and prospecting for radioactive boulder fields. The exploration methodology is similar to that which led to the discovery of significant mineralization at PLS. Skyharbour Resources Ltd. is a uranium exploration company and a member of the Western Athabasca Syndicate which controls a large, geologically prospective land package consisting of five properties (287,130 hectares or 709,513 acres) in the Athabasca Basin of Saskatchewan. $6,000,000 in combined exploration expenditures over the next two years is planned on these properties, $5,000,000 of which is being funded by the partner companies. 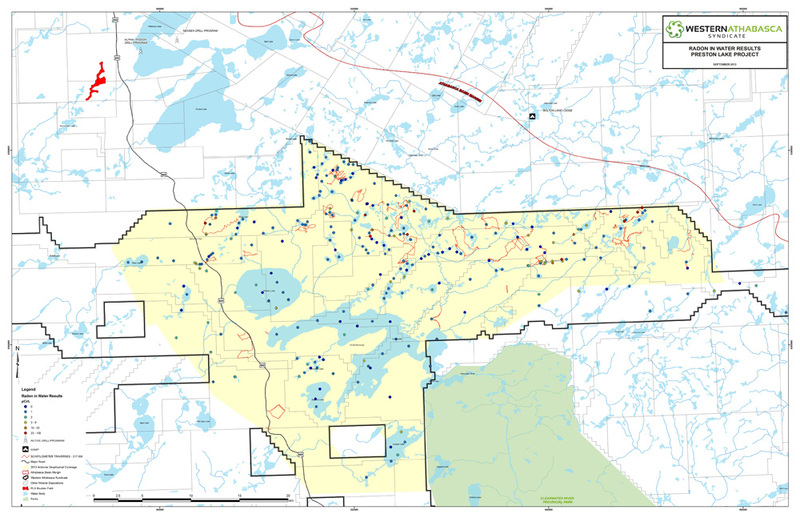 Skyharbour also maintains a diverse portfolio of precious and base metal projects in the Red Lake district of Ontario. The Company is well funded with $1.3 million in the treasury and has 43.6 million shares outstanding with insiders owning over 25% of the outstanding shares. Skyharbour’s goal is to increase shareholder value through new discoveries and developing exploration projects in geopolitically favourable jurisdictions.